Sadly I believe that chasing these promotions comes with a cost. My personalised offers have become harder and harder to achieve. First, it was targeting my hotel stays abroad and a number of hotels I have to stay, which are OK since I do travel and they measure against your stays to customise it. However, I personally believe that the latest is a promotion not great for me and I will nor be participating. 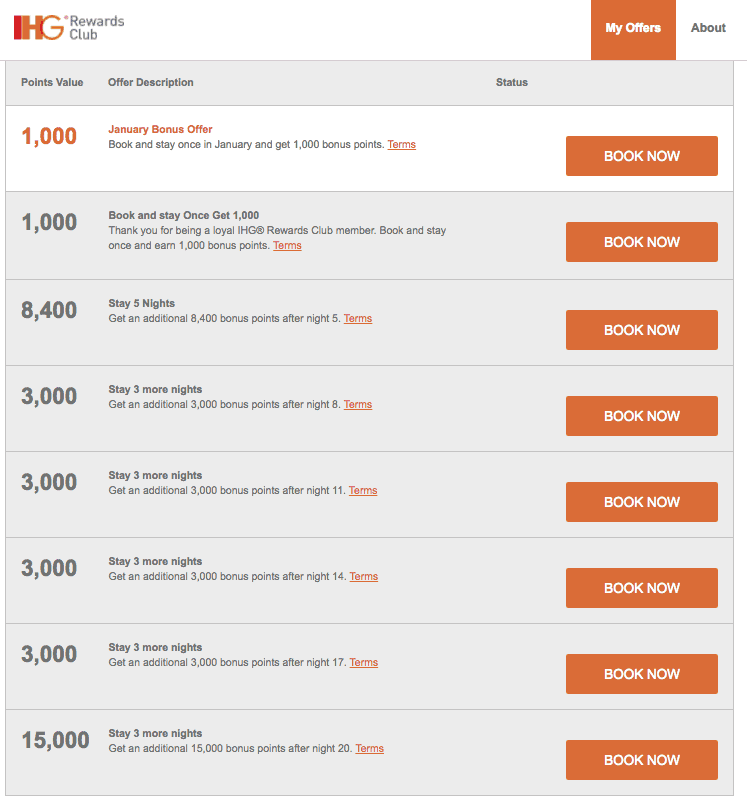 Some people received great offers for their IHG Accelerate, but mine currently requires 21 nights for 38,000 points. No extra bonuses no incentives other than a January book. You can check out your IHG Accelerate promotion for Spring time here. Since 2017 is a year full with hotel stays for me I was looking forward to running for the promo and receiving some points but considering that an average night around me costs £140 that means I need to spend approximately £3,000 to receive a bonus of 38,000 points. In my books not a very generous offer since the hotel redemption in my area is 35,000 points. Personally, I am better off spending 21nights with Hotels.com than IHG since for every 20 I will get 2 reward nights with an average value of £140. My husband’s promotion is very similar to mine, although we might just stay the 5 nights required to receive the 8,400 points. The total offer for him is 32,000 points. Unfortunately this quarter I will be skipping the promotion, but that is OK. I don’t expect that every quarter there will be a great offer, but I am looking forward to some other hotel promotions in Q1 2017. Yeah mine’s pretty crappy too.. I’ll pass 2000 points for 3 nights times then a weekend stay for 21k points.. I meant 2000 points for 3 nights , 3 times . 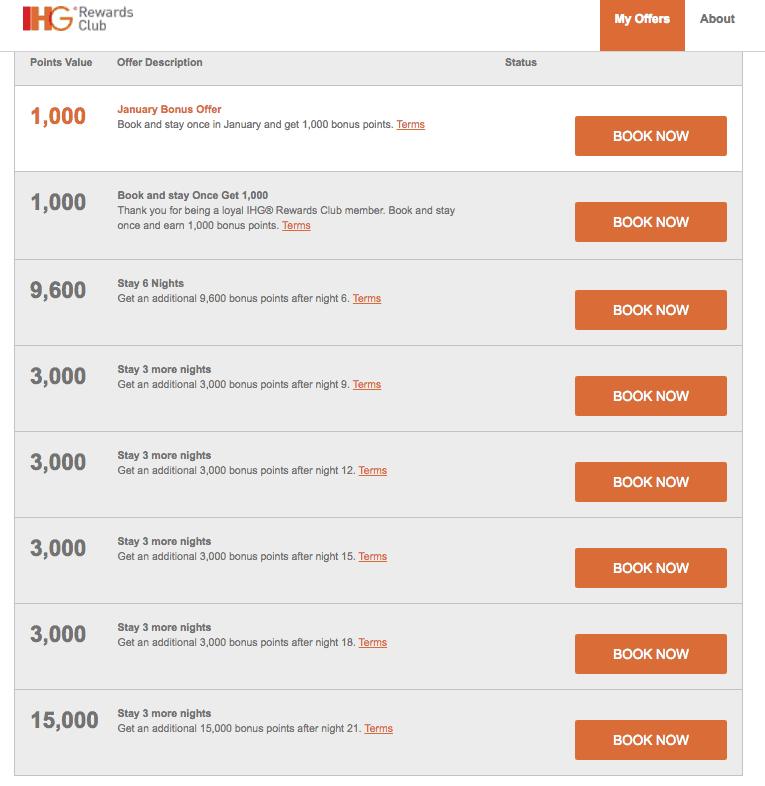 These are all based on how much you usually stay at IHG properties. If you and your husband both have accounts try switching your reservations between them. For example do all your stays on his account and leave yours idle until the next promo or two. Then switch once the offers get better. I skipped it last time. Without going into the details this time I can get 25K points in a one night stay (which I did last night for business). The only hang-up may be the Chase credit card use. That doesn’t seem to always update automatically.